This cake right here? A boozy, chocolatey creation like no other. I hadn't made a cake in quite some time, stupidly thinking I needed an excuse to go through the effort of making one. 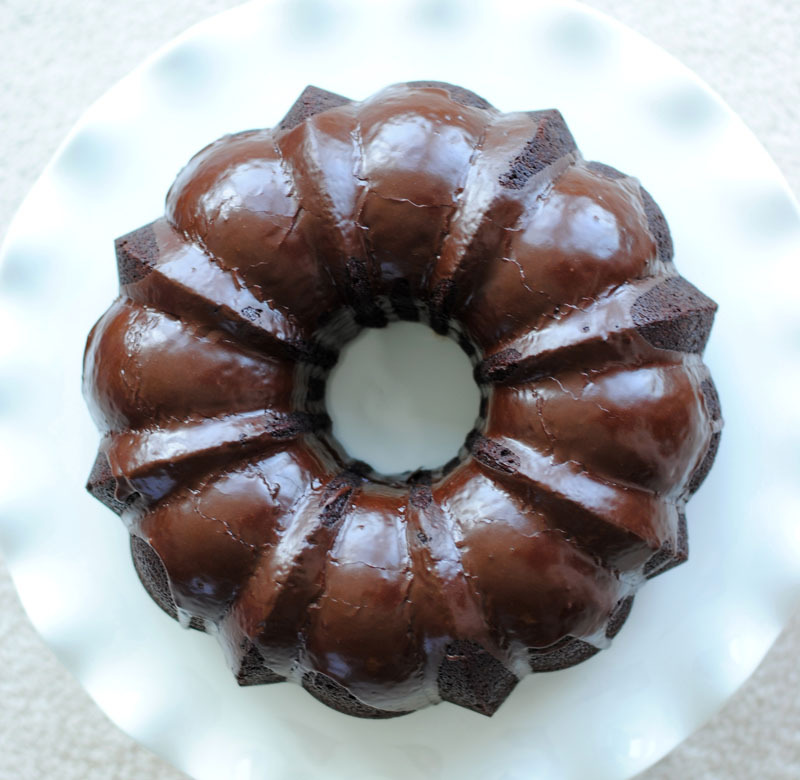 But bundt cakes can be very simple, and this one is no exception. This cake went from ingredients to baked in just over an hour. It has the perfect texture, too-- velvety and rich, but overly sweet or overwhelming. Neither the rum nor the coffee were too strong, although if you prefer a more subtle rum flavour, you can replace some of the rum in the recipe with more coffee. Preheat oven to 325 degrees. Grease the bundt pan well, either with spray or butter and cocoa powder (instead of flour to avoid white powder on the finished cake). In a saucepan over medium heat (*cough* microwave *cough*) heat the coffee, spiced rum, butter, and cocoa powder. Whisk until the butter is melted and everything smells delicious. Remove it from the heat and add the sugar, stirring until dissolved. Let cool for several minutes. In a large bowl, mix together the flour, baking soda, and salt. In another small bowl, mix together the eggs and vanilla, and once the boozy chocolate mixture is reasonably cool, add them together. Carefully whisk the boozy eggy chocolate mixture into the flour mixture until just combined. It will be somewhat thin—don’t worry! Pour batter into the greased bundt pan and bake for 40-45 minutes, until a cake tester inserted into the middle of the cake comes out clean. Let cake cool, then invert over a cake plate or wire rack and turn cake onto it. Let cool completely and glaze. Whisk together icing sugar, cocoa powder, rum (if using) and 2 tbsp of water. Slowly add more water to reach desired consistency. Place a wire rack on top of parchment or wax paper, and place the cooled cake on top. Carefully drizzle the glaze over the cake, ensuring even coverage.